A geyser of water shoots out of a sewer on Canon Avenue in Manitou Springs, Colorado. Floodwaters flow past a destroyed bridge in Lyons, Colorado. Walls of water cascading down hillsides caused flash floods across Colorado on Thursday, killing at least three people.  The flooding cut off major highways, isolated mountain towns and closed the main campus of the University of Colorado, the authorities said. “This is not your ordinary disaster,” said Joe Pelle, the sheriff of Boulder County, where two of the deaths were reported. Longmont's city manager declared a state of emergency Thursday morning as the rapidly rising St. Vrain River and Left Hand Creek effectively cut the city in two. As heavy rain continued falling late Thursday, homes, bridges and small dams built along the mountains that bisect the state collapsed, succumbing to rushing floodwaters and record levels of rainfall. Mudslides swept down hillsides left treeless by recent wildfires. Firefighters made dozens of rescues as cars were overtaken by rain-swollen creeks and roads suddenly gave way. Boulder County was hit hardest, with up to 6 inches of rain falling over 12 hours. But flooding was reported all along the Front Range, from Colorado Springs to north of Fort Collins. Capt. John Burt of the Colorado State Patrol said a storm cell moved over the mountains during the night, headed east over the Plains, then circled back around. The National Weather Service warned of an "extremely dangerous and life-threatening situation" throughout the region as the flooding forced people from their homes and caused mud and rockslides in some areas. "Move to higher ground now. Act quickly to protect your life," the Weather Service warned throughout the morning. Boulder Office of Emergency Management spokeswoman Gabrielle Boerkircher said many roads were blocked and volunteers were trying to help stranded people until emergency crews could arrive. Boerkircher told The Associated Press one person was killed when a structure collapsed in the tiny town of Jamestown. Boulder County Sheriff Joe Pelle said another person was also found dead in northern Boulder. "We're trying to get to Jamestown," Boerkircher said of a mountain community northwest of Boulder. "A lot of towns need assistance, and we cannot get through." Two other structures in the area were also damaged and may have collapsed. To the south, Colorado Springs spokeswoman Kim Melchor said police conducting flood patrols found a body in Fountain Creek on the west side of the city early Thursday. National Weather Service meteorologist Bob Kleyla said a 20-foot wall of water was reported in Left Hand Canyon north of Boulder, and a firefighter radioed he was trapped in a tree. He said rescuers were trying to get through, but were blocked by debris. 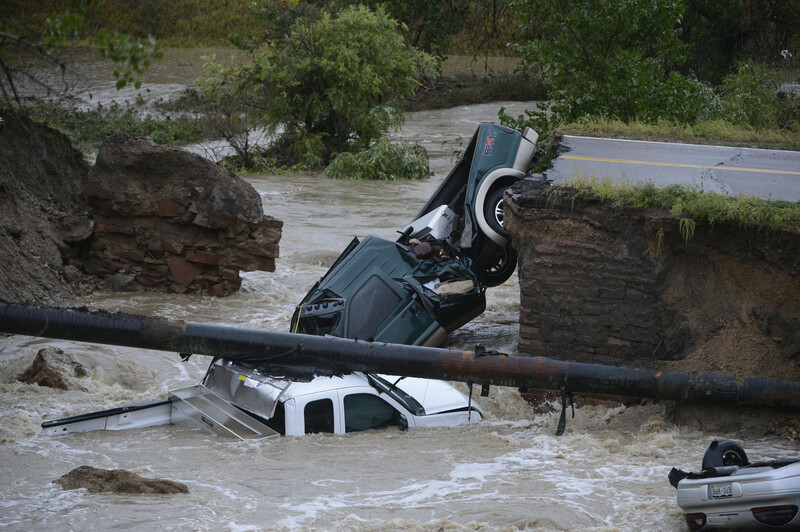 In Broomfield, U.S. Highway 287 collapsed when a culvert washed out, dumping three vehicles into the rushing water. Three people were rescued and had minor injuries. Near Lyons, about 2 feet of water was standing on U.S. Highway 36 as a normally shallow creek known for trout fishing flooded its banks. At least one earthen dam gave way southeast of Estes Park, the gateway to Rocky Mountain National Park, and water levels could rise downstream as authorities release more water to keep more dams from giving way. A National Guard helicopter requested to help pull people from their homes hasn't been able to take off because of fog and low cloud cover throughout the area. Flash flood warnings were issued for multiple counties in the region, including Jamestown and the Fourmile wildfire burn area. Flash flood emergencies were also issued downstream from the Front Range mountain areas, including Fort Lupton, Dacono, Plateville and other farming areas as debris piled up near bridges. An evacuation center for the mountain residents has been sent up in nearby Nederland, officials said. Meanwhile, about 400 students in a dorm at the University of Colorado in Boulder were evacuated and classes were canceled Thursday and Friday because of the flooding. Mudslides and rockslides were reported in several areas, with parts of U.S. 6, Boulder Canyon, Colorado 14 and U.S. 287 all reporting problems and temporary blockages during the evening Lefthand Canyon was reported blocked by one of the many slides. Boulder police dispatchers were receiving calls of flooded homes and streets and submerged cars. One volunteer fire crew was stranded on a mountainside after a wave of rainwater abruptly washed out a road, the authorities said. Much of the worst of the flooding Thursday appeared to be in Boulder, where the university canceled classes Thursday and Friday and some 500 students and staff members were ordered evacuated. Dozens of buildings have been damaged, the university said, including the school’s theater and the Norlin Library. But the warning did not dissuade some people from flocking there. They stood on bridges marveling at the torrent of fast-moving brown water as it swept away anything in its path. A few miles north, a 50-yard wide portion of Route 36 was submerged as a stream bed overflowed and coursed by at 1,000 cubic feet per second, said Anne Reid, a firefighter with the Lefthand Fire Protection District. “This is usually just a little stream that you wouldn’t even think to fish in,” Ms. Reid said. The flooded highway has cut off residential areas for the foreseeable future, sweeping up whole willow and cottonwood trees as if they were twigs. John and Billie Brumder, who live across from the Crestview Estates neighborhood, said they were awakened at about 1:30 a.m. Thursday by the frightening sound of large rocks being dragged along the creek bed. Their car, which was already partly submerged, stalled, Mr. Brumder said, but they were able to escape in their pickup truck. The authorities said Thursday afternoon that they expected the death toll in the state, currently at three, to rise. One person drowned and a second person was killed when a structure collapsed in the town of Jamestown, northwest of Boulder. The third victim was found in Colorado Springs by police officers conducting flood patrols. Rain had been falling in the Boulder area since Monday, but picked up significantly on Wednesday evening, causing mudslides in Colorado’s Front Range, where since 2010 wildfires have denuded some areas of trees and brush that would have normally helped soak up the moisture. Dozens of streams and creeks overflowed, and downstream, portions of Colorado Springs and Denver flooded, as well as large parts of Boulder. The National Weather Service reported that more than 6 inches of rain had fallen in a 12-hour period. Forecasters predicted that the rain would continue into Friday. According to provisional data from the United States Geological Survey, parts of Boulder Creek reached flood levels that have a 1 in 100 chance of occurring in any given year — what some refer to as a 100-year flood. Sylvia Tawse, who owns a vegetable and flower farm in Longmont, said her husband got a call at 3 a.m. from the local fire chief, warning that a 20-foot wall of water was barreling down nearby Left Hand Creek. Ms. Tawse’s property, nestled among a patchwork of family farms about 10 miles north of Boulder, was spared. But her neighbors were not so lucky. Ms. Tawse said that by early Thursday, Left Hand Creek, typically barely a trickle, had swollen into a raging rush of muddy water. Once-gleaming villages in the foothills of central Colorado are virtual ghost towns, isolated by gaps in the asphalt and rivers that undid a century of civilization in a week of heavy rain. In Glen Haven, a 400-person jewel box on the road to Rocky Mountain National Park, an estimated 80 percent of the homes are empty and every business downtown is closed or totally gone — swept seven miles into the town of Drake, a thousand-person tourist draw that’s also now obliterated and empty except for a handful of holdouts who refused to be evacuated. “We saw the whole town kind of explode,” said Bob Smallwood, Glen Haven’s assistant fire chief, and one of ten people left in a 200-home neighborhood called The Retreat. The water that cascaded out of the Rockies last month ripped through 24 counties, killing nine people and dampening 2,500 square miles in the heart of Colorado. But the communities of Glen Haven and Drake may be the most devastated, deserted areas left — as well as the most at risk of becoming genuine ghost towns. For 36 days he says he saw no county or state road crews in Glen Haven, a delay that Larimer county (which has responsibility for Glen Haven) says was unavoidable given the magnitude of damage in the area. Whatever the reason, it slowed the return of other services, trapping half the town in the 18th century: high on the mountain without phone or power, or a way down that doesn’t involve a backpack and very sore feet. Huge tracts of roadway between the two towns are scoured to bedrock, and expected to stay that way until at least 2015. It’s a similar scene in Drake, where U.S. Highway 34 has been returned to canyon in places and a bridge washed out, cutting off access to the mountain. The difference in Drake is that the road work is booming, as the state shells out to restore access to Estes Park, the headquarters to Rocky Mountain National Park. But the progress comes at a cost: The road is closed indefinitely during construction, and residents get only one four-hour window a week to work on their homes or welcome damage assessors, before abandoning town again as the road re-closes. The result is “a barren wasteland,” says Drake resident Susan Egloff, who fled last month as the waters rose, sending her house down river toward Loveland. The 51-year-old office manager returned for the first time two weeks ago, finding one of her family’s cars intact. Last week her son found another balled like Play-Doh a mile downstream. One has to marvel at the destruction, she says, and to laugh at the insanity of the scenario: a disaster so bad it can’t be even reached by disaster relief. In a season without a thousand-year flood, the roads would unspool beautifully around Drake and Glen Haven, carrying 35,000 cars a day. The area itself would swell to 50,000 people, especially in October. “It’s kind of scary,” said Dave Johnson, the president of the Glen Haven homeowners association. Just how rare was the deluge in Colorado that resulted in the deaths of at least 10 people, hundreds unaccounted for, nearly $2 billion in property damage, the evacuation of more than 10,000 people that affected at least a 200 mile stretch of the state, north to south? Very rare. So rare that the amount of rainfall is likely to occur less than once every 1,000 years. That's according to new analysis from the National Weather Service which found that two regions -- one extending from Boulder to Estes Park and the other around Denver suburb of Aurora and areas south -- experienced once-in-a-millennium amounts of rain. "As it kept raining and kept raining and kept raining, this thing kept getting more and more rare, in terms that we use for evaluating," said Geoffrey Bonnin, chief of the Hydrologic Science and Modeling Branch of the NWS, to Reuters. It was so much rain that the NWS itself was compelled to describe the amount falling in the once-in-a-millennium storm as "biblical" last week as flood waters continued to rise. The City of Boulder received so much rain that it already broke its yearly record for precipitation with three months still left in 2013. TIME's Bryan Walsh points out that the once-in-a-millennium rainfall doesn't literally mean this kind of rain only happens once every 1,000 years; rather, a flood of this magnitude has only a 0.1 percent chance of happening in any given year. The floods were triggered by widespread torrential rains of 4 - 6" that fell in less than twelve hours, thanks to a flow of extremely moist air from the southeast that pushed up against the mountains. These sort of upslope rain events are so-named because as the air flows uphill, it expands and cools, forcing the moisture in it to fall as rain. Balloon soundings from Denver last night and this morning recorded the highest levels of September moisture on record for the station. First, look for the counter-clockwise circulation pattern over the western United States. A monsoonal flow like this is not unusual in Colorado — during the heart of the summer. But it usually dissipates by late Labor Day. This year it has not. Instead, it has been on steroids. Add to that an anticyclonic circulation (clockwise) in the Midwest. This has been pushing water vapor into the Front Range region as well. In other words, two circulation patterns have come together in just the right way and just the right time to draw large amounts of water vapor into Colorado. All of that water vapor has pushed up against the Front Range (the easternmost extent of the Colorado Rockies) and has had trouble getting over it. In addition, a stationary cold front that had moved in from the north also has tended to keep the moisture pinned over us. You can see a GIF animation of what Yulsman describes on Discover's website. "The main thing that occurred was just the huge amount of rain over such a large area," Dr. Russ Schumacher, Assistant Professor of Atmospheric Science at Colorado State University, told KDVR when asked which main factor caused the flooding. "As meteorologists in Colorado, the events we always think about are the Big Thompson flood of 1976 or the Fort Collins flood of 1997, and these are a lot of rain but over a very localized area. The difference here is that the rain fell over entire counties essentially at that same amount of rain, so it's just an overwhelming amount of water for any of these creeks or streams to handle." The 1976 Big Thompson flood, although localized as Schumacher said, was incredibly devastating to the region, resulting in 139 deaths. A slow-moving thunderstorm dumped a foot of rain in under five hours, producing a catastrophic wall of water through the canyon, Climate Central's Andrew Freedman wrote. Incredibly, September's rainfall caused the Big Thompson river to swell beyond what it did during the 1976 flood -- by more than 1 foot at the North Fork, according to NWS. The flooding was so bad that it destroyed three of five river gauges designed to measure floodwaters, said Robert Kimbrough, hydrologist at the U.S. Geological Survey in Colorado, to LiveScience. Justin Lewis, a Colorado-based geo-developer, took the USGS river data that lasted through the flood and graphed it out showing the dramatic increases in water discharge in the rivers. 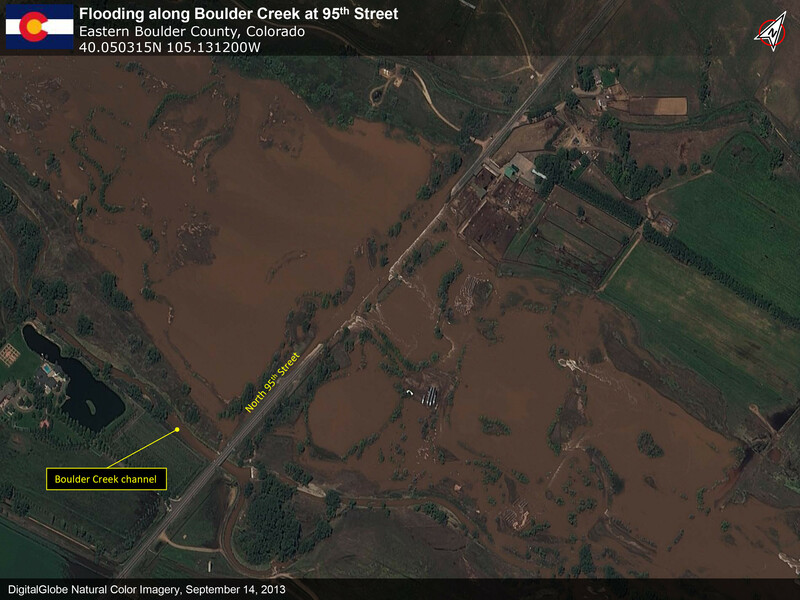 SEPTEMBER 14, 2013: This is a satellite image of Boulder, Colorado showing the severe flooding that has occured collected on September 14, 2013. On Sept. 11, Boulder Creek, measured near Longmont, went from around 500 cubic-feet-per-second (cfs) -- already over 1,000 percent higher than average -- to 5,170 cubic-feet-per-second, or 19,785 percent over average at its peak on Sept. 13, according to USGS data and Lewis' graph. During the same date range, the Big Thompson River measured near Estes Park also saw dramatic increases from under 100 cfs to over 1,000 cfs at its peak. The Big Thompson measurement at Loveland is incomplete due to the damaged stream gauge, but the last measured water volume was 4,670 cfs -- up from under 100 cfs, a 16,003 percent increase from average. 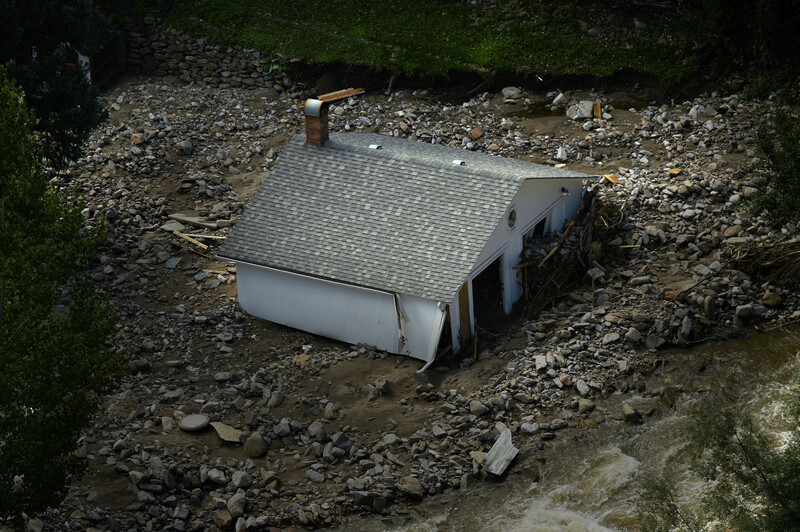 Severe damage from the deadly floods that swept Colorado could keep residents of Lyons out of their homes for up to 6 months. E. coli bacteria contaminated the drinking water system for Lyons, and the wastewater system suffered at least $1 million in damage. To the north in Larimer County, at least 82 people were still unaccounted for after the flooding last week, and Larimer County sheriff's spokesman John Schulz said some of those eventually would be added to the official list of missing. "We certainly expect that a number of people on that list will be listed as missing rather than unaccounted for and will turn up dead,” Schulz told Reuters. “We hope that will be a low number." The list of people who are unaccounted for statewide has been steadily falling from 1,200 a few days ago, Reuters reported, as families reunite, evacuees register and rescue teams reach areas cut off by the floods. The official death toll stands at seven: four in Boulder County, two in El Paso and one in Clear Creek County. But at least three others are presumed dead, and Reuters said search dogs were combing a large debris field near Loveland in the Big Thompson River canyon. When torrential rain and flooding began last week across the central part of the state, homes were destroyed, roads washed away and vital infrastructure damaged. The flooding also hit oil fields on the state’s Front Range, and authorities said Friday that at least 22,000 gallons of oil had spilled from tanks, complicating the cleanup effort. Authorities in areas downstream in Nebraska warned residents to avoid contact with flood water. Property losses could hit $2 billion, the catastrophe modeling firm Eqecat said Wednesday in its first comprehensive estimate. Though water levels on the South Platte River were receding, muddy brown waters were still out of the river’s banks near Greeley, Colorado, on September 17, 2013, when the Operational Land Imager (OLI) on the Landsat 8 satellite acquired this image. At the time, the river was more than six feet above flood stage, down from more than eight feet above flood stage. 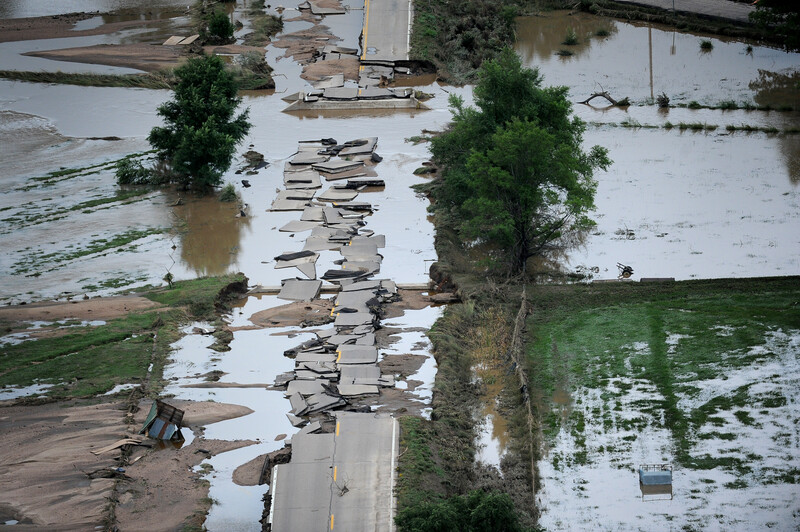 The image shows that the flood has washed away roads, including sections of U.S. Highway 34. Farmland and a few developed areas are under water. Heavy rain caused flooding across the Front Range of the Rocky Mountains starting on September 11, and much of that water made its way into the South Platte River. The river reached a record 18.79 feet in the early morning hours of September 14. The previous record crest was 11.73 feet. Flood stage is 10 feet. As the water subsides in Colorado, it is expected to swell the river downstream in Nebraska. As of September 18, floods had affected 17 counties in Colorado, leaving six people dead, 306 missing, and more than 18,000 evacuated, according to the Colorado Office of Emergency Management. Early estimates place the cost of the floods at two billion dollars. Though destructive and costly, all of the excess water may help parts of Colorado recover from drought. The rain helped refill some depleted reservoirs and recharge dry soil. However, it also damaged irrigation infrastructure, so the impact on farmers is mixed. Intense rainfall in northern and eastern Colorado brought widespread, destructive flooding in mid-September 2013. Local citizens reported as much as 18 inches (46 centimeters) of rain from September 9 to 15, with some of the heaviest accumulation along the front range of the Rocky Mountains. A break in the precipitation allowed the Moderate Resolution Imaging Spectroradiometer (MODIS) on NASA’s Aqua satellite to acquire the top image of the floods on September 14. The lower image, taken by Terra MODIS on September 7, 2013, shows the region before the rains began. The images were made from infrared light to increase the contrast between water and land. Water is typically black or dark blue in these images, but here the sediment-laden water and muddy ground are light blue. (In the true-color version, the muddy river blends with the brown landscape that surrounds it.) Irrigated farmland is bright green, while natural vegetation and bare ground are pale green and tan, respectively. Bright blue and white clouds still cover cities along the front of the Rocky Mountains, including Denver, Boulder, Loveland, and Fort Collins. The South Platte River and its tributaries are swollen in the September 14 image. The South Platte peaked at 18.79 feet (5.73 meters) immediately east of Greeley on September 13 and was beginning to fall when the image was taken. Flood stage is 10 feet (3 meters). Flooding throughout Colorado has forced the evacuation of 11,750 people. Five people had died and 1,253 were missing as of September 15, according to the Colorado Office of Emergency Management. Many roads shown in image area are closed. U.S. President Obama issued a disaster declaration for 15 counties in Colorado. 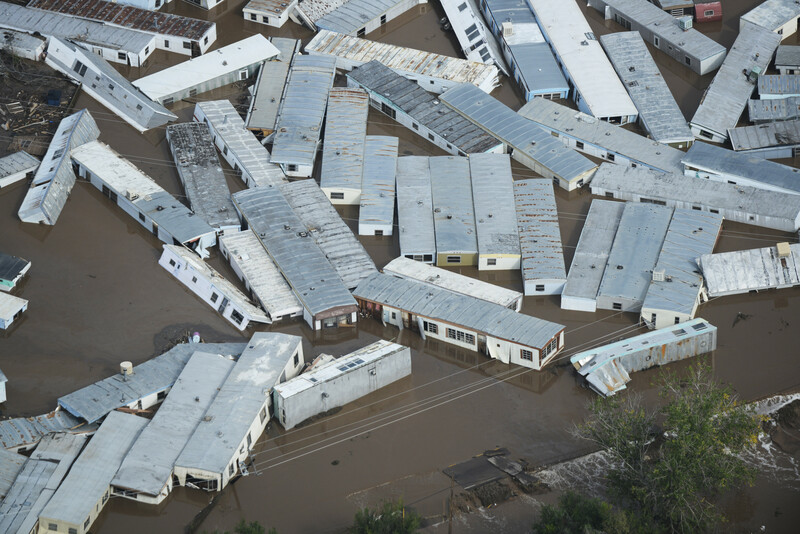 The number of people unaccounted for in flood-ravaged Colorado rose Sunday to 1,254. The number of people unaccounted for in flood-ravaged Colorado rose Sunday to about 1,000 as flooding spread to 15 counties and rain continued to fall. "We don't expect to find 1,000 fatalities," said Micki Trost, a spokeswoman for the Colorado Division of Homeland Security and Emergency Management. Four fatalities — three in Boulder County and one in El Paso County — have been confirmed since the rain began Wednesday evening. Still the number of fatalities could rise. An 80-year-old woman in Larimer County's Cedar Grove was missing and presumed dead after her home was washed away by the flooding Big Thompson River, the county sheriff's office said Sunday. The woman was injured and unable to leave her home Friday night, sheriff's spokesman John Schulz said. A 60-year-old woman is also presumed dead after the river destroyed her home the same night. Some people just don't know what's come of their relatives. A Dallas man saw a photo of his mother's Big Thompson Canyon home in ruins on a Denver TV website. "I don't know that she's even OK," Rob Clements told The Coloradoan about his mother, Libby Orr, 73, with whom he last spoke on Thursday. "I presume she is. But her house, if not completely gone, fell into the river and is most of the way gone." Many roads and bridges in the state are damaged or destroyed, said Amy Ford, a spokeswoman for the Colorado Department of Transportation. Crews are assessing the extent of the damage, which will cost "hundreds of millions" of dollars to repair, she said. People stand at the edge of a highway washed out by flooding along the South Platte River in Weld County, Colorado near Greeley, Saturday, Sept. 14, 2013. Hundreds of roads in the area have been damaged or destroyed by the floodwaters that have affected parts of a 4,500-square-mile area. Heavy storms returned to northeastern Colorado on Saturday as rescuers scrambled to take advantage of breaks in the weather to continue reaching stranded residents. The National Weather Service issued severe thunderstorm warnings for parts of Arapahoe and Adams counties and eastern Denver. The service said 1.73 inches of rain fell in less than 30 minutes at one spot in southeastern Denver. "We just got ... a forecast that we could get 2 to 4 inches of rain, which could be devastating," Boulder County Sheriff Joe Pelle told reporters shortly after 6 p.m. MT (8 p.m. ET). The agency expected thunderstorms across the region Saturday evening and more rain at least through Sunday. Authorities are worried that any additional water on ground soaked by up to 15 inches of rain will cause more flooding and dislodge mud and debris. In addition, a 60-year-old woman was presumed dead after witnesses saw her being swept away by waters that demolished her home, said Nick Christensen, executive officer of the Larimer County Sheriff's Office. Neighbors tried unsuccessfully to rescue the woman, Christensen said. Her body had not been recovered. The sheriff's office said that about 350 people were unaccounted for in Larimer County. That number jumped sharply Saturday afternoon as rescuers reached more empty homes. The sheriff's office lists such residents as unaccounted for until they are located elsewhere. In neighboring Boulder County, 172 were unaccounted for. "We're assuming some of them have been stranded. We're assuming that some made their way out and simply haven't contacted us or friends and family to get off the list. We're assuming that there may be further loss of life or injuries," Pelle said. A surveillance mission carrying Gov. John Hickenlooper and members of Colorado's congressional delegation was diverted twice to pick up people waving to be rescued. ALBUQUERQUE, N.M. -- New Mexico residents began cleaning up and assessing the damage on Saturday after harsh flooding ruptured dams and claimed the life of at least one person. State Police Sgt. Emmanuel Gutierrez said the body of a man was found in his vehicle next to State Road 51 in Ash Canyon, about 150 miles from Albuquerque. Investigators believe the man died after his vehicle washed into a ravine covered in mud near the Elephant Butte dam and was washed nearly a miles off roadway, probably Friday during the flooding, Gutierrez said. The death is the first related to massive flooding in New Mexico this week from record heavy rains and overflowing rivers. Officials said heavy rain on Friday caused the Rio Grande and nearby creeks to overflow in Sierra County - where the man was found - and forced an unknown number of residents to evacuate. The flooding also ruptured an earthen canal in Las Vegas and an aging earthen dam in southern New Mexico causing havoc and putting rescue workers on notice. In response, Gov. Susana Martinez issued a state of emergency to open up recovery funding. The governor was scheduled to tour affected areas Saturday. The ruptures came after parts of New Mexico saw record rainfall through the week and rivers began to overflow causing millions of dollars in damage and small evacuations. The canal east of Bradner Dam near the village of Los Vigiles gave in late Thursday or early Friday, which caused flooding in the city of Las Vegas and wreaked havoc throughout San Miguel County, officials said. Las Vegas Mayor Alfonso Ortiz said repairs could take days, if not longer. In addition, three of the four major bridges in Las Vegas - Bridge Street Bridge, Independence Street Bridge and the Mills Avenue Bridge - were closed at some point Friday. All but Bridge Street later reopened. "It is widespread and throughout the county," Leger said of the flooding. "We're telling people to stay away from water courses. If you're safe where you're at, stay there. If you're home, and you're safe, stay there." More than two dozen homes on the Santa Clara Pueblo were ordered to evacuate after floodwaters approached homes. The area had been hit hard due to the Las Conchas Fire in 2011, which created a burn scar and made the canyon especially vulnerable to a flood. We are due for more rain starting this afternoon. It will let up through the latter part of the day but is expected to bring another 1 - 2 inches this evening and into tomorrow. The flooding to the east in Weld County where the water from Boulder, Lyons, and Fort Collins area converges is also being described as a 500 - 1000 year flood. The flooding has affected an area almost the size of Connecticut. By air and by land, the rescue of hundreds of Coloradoans stranded by epic mountain flooding was accelerating as food and water supplies ran low, while thousands more were driven from their homes on the plains as debris-filled rivers became muddy seas inundating towns and farms miles from the Rockies. For the first time since the harrowing mountain floods began Wednesday, Colorado got its first broad view of the devastation - and the reality of what is becoming a long-term disaster is setting in. The flooding has affected parts of a 4,500-square-mile area, almost the size of Connecticut. National Guard choppers were evacuating 295 people - plus pets - from the mountain hamlet of Jamestown, which was isolated by flooding that scoured the canyon the town sits in. The outlook for anyone who'd rather stay is weeks without power, cellphone service, water or sewer. "Essentially, what they were threatening us with is, 'If you stay here, you may be here for a month,'" said 79-year-old Dean Hollenbaugh, who was evacuated by Chinook helicopter from Jamestown, northwest of Boulder.